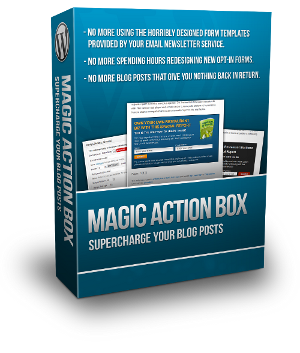 With Magic Action Box you can take your blog content to the next level. Imagine, all of your hard work never going to waste and each blog post helping to build your streams of passive income while you sleep! It doesn't matter what email marketing service you use, Magic Action Box works with any service and lets you create amazing forms in your posts! Stop letting your content go to waste! With Magic Action Box you guide your visitors to your sales pages using custom Sales Box types to increase conversions. No more settling for crappy opt-iin form templates that your email marketing service gives you. Look like a professional blogger and get more loyal visitors on your email list! Make amazing forms without having to pay someone else to do it. You can make amazing forms that will increase sales in less than 3 minutes!